This is one of those classic moments in my life where I prove to myself Twitter is just *bad. Ok, not that bad, (my bad). The last few days I have had some things on my list, one of which was photographing my workspace for a cool post idea by Darren Jones . I just loved the concept of it, always fun to be able to put a image to imagination, especially with people you chat to most days. 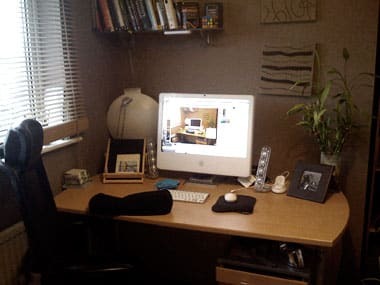 Darren’s 10 Creative Workspaces *Plus One Extra One. I didn’t even think about a deadline and promised myself I would get that task done and submitted to day. So I tidied up a little, not too much you understand, and took the photo with the iPhone. Happy one task could be crossed off the list, I got ready to submit it to Darren’s Blog and was confronted with a ‘Post Closed’ message. Awwww man! Serves me right for not prioristing. But eager not to let it go to waste thought I could just knock up a quick post here, link back, trackback and all that to Darren’s original post and all will be cool. So here is Darren’s 10 Creative Workspace *Plus One Extra One. This is my workspace. 24″ iMac and my trusted Harmon Kardon speakers, which are the 1st generation model, purchased pretty soon after they were first sold. And still going strong. Chocolate brown wall paint, with pine blinds with a view out to the hills, the cliffs and the sea. On the shelf you can see my 4×4 Rubik’s cube, loads of graphic design books: Logo Design Books, Indie Font Books, Letterhead and Logo Design Books, Logo Lounge Books, Branding Books, yada yada. All nicely to hand. The desk is a professionally designed height adjustable desk as is the chair which offers full support, even in places I didn’t realised you needed support. But all essential to provide the healthiest of work stations, no bad back. Nice. The black spongy thing is a black spongy thing which i used to rest my elbow on with a black mouse pad that has a raised wrist support. Then just a photo of my part time dog Fermoy and some bamboo shoots.